After two days in Yellowknife, capturing the Northern Lights and eclectic cityscapes, a group of photographers landed in the heart of the Barrenlands for the next portion of their session behind the lens. They quickly realized it had already begun. The group’s arrival at Peterson’s Point Lake Lodge coincided with the spring migration that sees thousands of caribou head North to their calving grounds. The annual event may not greet every visitor at the lodge, but even the hour-and-a-half flight in from Yellowknife over thousands of lakes, as the treeline disappears into tundra carved with sand eskers, is enough to have most photographers reaching for their cameras. So, be sure to keep it close at hand. 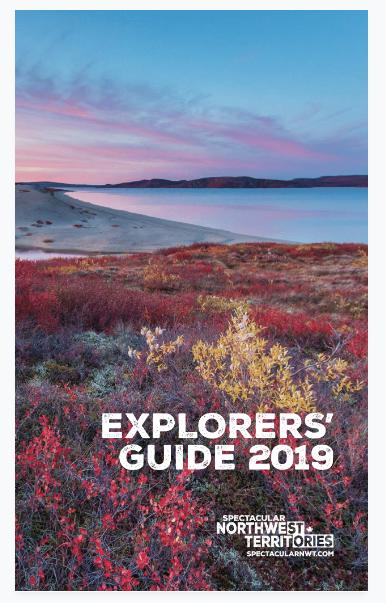 Since 2009, a photography program has been offered at Peterson’s Point Lake Lodge, giving both professional and amateur photographers the chance to capture the True North in a big way. Whether using a point-and-shoot or a DSLR, photographers can get close-ups of migratory wildlife, grizzly bears, Arctic foxes, and birds ranging from tundra swans and ptarmigan to peregrine falcons. And while the wildlife is a sight to be seen, the Barrenlands takes on a life of its own as fall colours sweep the rugged landscape. The vibrant red and burnt-orange of the fall isn’t the only palette to work with for photographers at Peterson’s Point Lake Lodge. One of the North’s most notable features, the Northern Lights, are at their best around the spring and fall equinoxes. And if you’re not sure you're sufficiently camera-savvy for capturing the Aurora, they’ve got that covered. The photography program is led by celebrated outdoor and nature photographer Dr. Robert Berdan. His work has been featured in National Geographic and garnered numerous awards. He’s also been teaching and writing about photography for more than 20 years. Throughout the program, Berdan will work with guests of all skill levels, covering topics including macro, landscape, wildlife and Aurora photography. The fact is, the Barrenlands have it all: wildlife, the Northern Lights, fall colours, vibrant lichen, and sprawling lakes. Even anglers heading up to reel in a 40-pounder are encouraged to bring their camera to Peterson’s. Chances are, more than a few capture-worthy moments will occur throughout the trip. And likewise, you can’t visit Peterson’s without taking in a luxurious shore lunch of fresh fish, caught and prepared right out of the clear waters of Point Lake. There’s nothing like scouting shots and reeling in the catch of the day at the same time. Whether a fish enthusiast or just taking in the unmatched scenery of the Barrenlands, Peterson’s Point Lake Lodge is certainly worth a shot.